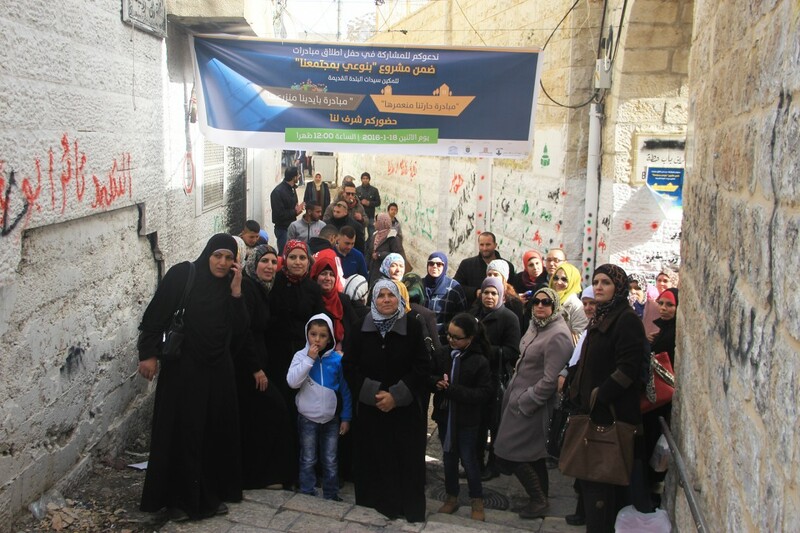 Burj Al-Luqluq Social Center Society organized two initiatives; “We Build Our Neighbourhood” and “We Plant Our Neighbourhood by Our Hands” for the women of Bab Hutta neighbourhood, within “We Aware Our Community” project, executed by Burj Al-Luqluq, funded by the Swedish Agency through UNESCO, and supervised by the Welfare Association in the Old City. The initiative started with the participation of more than 40 women of Bab Hutta neighbourhood who planted jars with natural and artificial plants. After they prepared the jars, they distributed them and hung them underneath the windows of the houses in order to water them easily. Moreover, they distributed plastic trashcans around them neighborhood, in front of houses. On the other hand, a number of volunteers from Burj AL-Luqluq helped to distribute metal trashcans around the neighborhood. This action aims to aware women about the importance of keeping their neighborhood clean and hygienic, in addition to aware them about the important of recycling to make creative things. Rula Al-Joulani, the project coordinator, said that Burj Al-Luqluq aimed, through this initiative, to improve the reality of the women and children of Bab Hutta, as they have been trained for four months by a specialized trainer.